A special friend gave us a memento that we keep in a special place in our home. It is a small stone that reads, “Friends are our chosen family.” As I write this, appropriately on Valentine’s Day, I think about close friends of mine and the lifelong friendship of two extraordinary men whose lives I wish to acknowledge as we celebrate Black History Month. 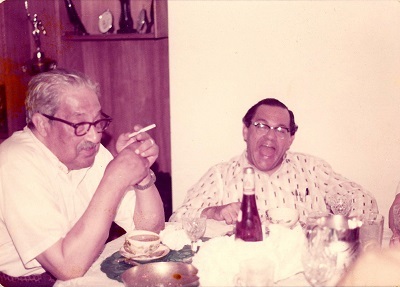 The two men are Supreme Court Justice Thurgood Marshall and Attorney Wiley A. Branton, Sr., who was also my father-in-law. Thurgood and Wiley’s friendship began in the mid-1950s when Wiley was a young lawyer in Pine Bluff, Arkansas, and Thurgood was a lawyer in NYC, working for the NAACP. Wiley was a local lawyer who was asked to handle cases in the South when the NAACP could not send a lawyer from New York to handle the case. 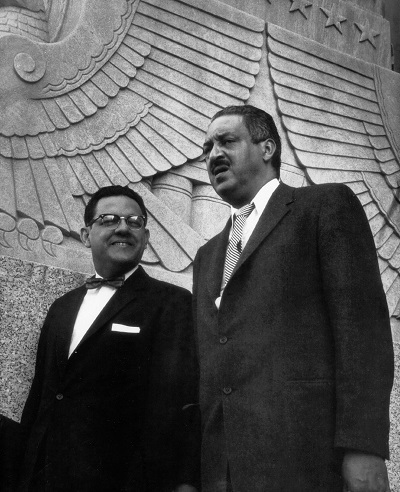 Wiley A. Branton and Thurgood Marshall on the steps of the Supreme Court after the court’s decision Cooper v.Aaron, commonly known as the Little Rock Nine case, which provided for the desegregation of public schools. Wiley, as Chief Counsel, asked Thurgood to assist him when the case went to the highest court in the land since Thurgood had previously argued before the Supreme Court. Their friendship continued over the years and eventually both men ended up in Washington. Thurgood served as Solicitor General and then, of course, as Justice of the Supreme Court. Wiley left his job as Director of the Voter Education Project in Atlanta and moved to DC to serve in the Johnson administration and later served as Dean of the Howard University Law School and as a lawyer in private practice. While both men had key positions in Washington, DC, their families were also very close. As a teenager, my wife, Wylene, babysat the Marshall boys, Goodie and John. To this day, when John introduces Wylene, he says, “I want you to meet my babysitter.” Thurgood’s wife, Cecelia, “Cissy,” still lives near DC and came to Rockland several years ago when Thurgood was inducted posthumously into the Rockland County Civil Rights Hall of Fame. It was clear to those who observed the two men that there was an extraordinary friendship between them. Thurgood was very private, and the Branton home was one of the few places he would visit for dinner because he did not want people stopping him to greet him in restaurants and other public places. Both men were great storytellers and often laughed to ease the tension of the sometimes dangerous work they did in racist Southern towns. What also bonded them was their love and respect for the law. They both believed justice and equality could be achieved in a more lasting way through the law and the courts. I was very pleased to attend a presentation last week by Dr. David Lucander in which he discussed the differences and similarities between Thurgood Marshall and his teacher/mentor, Charles Hamilton Houston, also a former Dean of the Howard University Law School. This discussion prompted me to think about the close friendship between Marshall and Branton. It is appropriate that we honor their achievements and their friendship during this special African American History Month. Justice Marshall and Attorney Branton swapping tall tales but true at the Branton supper table.